https://sep.yimg.com/ay/yhst-33477391359232/copperband-butterfly-fish-chelmon-rostratus-copperband-butterflyfish-beaked-coralfish-6.jpgCopperband Butterfly Fish - Chelmon rostratus - Copperband Butterflyfish - Beaked Coralfish DifficultPeaceful75 Gallon7.9 inchesYes, with CautionCarnivore, ClamIndo-PacificChaetodontidaeSmall 1" - 2"
The Copperband has an elongated mouth which it uses to pick at coral heads, including nuisance Aiptasia. These fish will accept many fish foods, but require excellent water quality. The Copperband is very docile and gets along well with other community fish. It is best to only keep one per tank. Maximum Size: Copperbsnd Butterfly Fish can grow to 8 Inches. 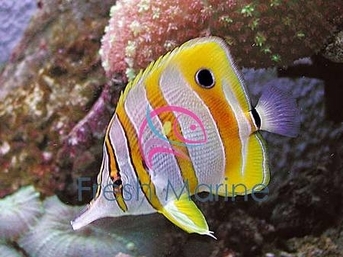 General Size Specifications: Small: 1-1/2" to 2-1/2"; Medium: 2-1/2" to 4"; Large: 4" to 6"
Minimum Tank Size: Copperband Butterfly Fish prefers a tank of at least 50 gallons with plenty of places to hide & swim. Feeding and Diet: Omnivore. Offer a varied diet including crustacean flesh, mysid shrimp and frozen preparations. Feed at least three times daily. Breeding: The Copperband Butterfly Fish is an egg-scatterer.